Dan Abnett and Nik Vincent have come together to tell a tale of a future that feels and sounds not like what one would envision, resembling more our distant past then our near future. Many readers will know of Dan Abnett and his prolific work with Marvel, Abaddon, Games Workshop, and his most successful work, Gaunt’s Ghost (where I was first introduced to Abnett). Other readers might come to this story having already been exposed to the Kingdom comics from where our story takes places. In Kingdom, the world was first introduced to the struggled between the genetically engineered dog-soldiers and the alien invaders, simply known as Them. 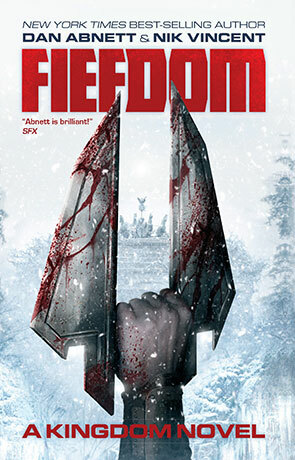 Fiefdom and it’s comic series holds a rich world that is unique among the plethora of series existing today on the market. Synopsis: Ice hides a familiar Berlin, burrowed meters under centuries of ice. Hidden in the tunnels are fiefdoms (clans) of dog-soldiers, divided but surviving. Each fiefdom has eked out an existence differently from the others. Some are willing to trade while others prefer to remain in isolation. What they know of their past is passed on through tale-tellers who not only preserve the distant past but instruct pups in the art of fighting by telling the legend of Gene the Hackman. Gene the Hackman, top dog, him done the great Walk Around. Not for him the darkness, not for him the cold, not for him the Time of Ice that we know today. Our protagonist, Evelyn War, becomes the last Believer for the Zoo Pack after her father, a Hearer, dies. Fulfilling his final mission given to him by the Master’s Voice, Evelyn War stops at nothing to see the scattered fiefdoms unite against an ancient enemy that has woke from the ice. The time too has come for all dog-soldiers, Alphas, scrappers, and pups, to wage war. Time is now to get whet and unite, because there is strength in numbers! Critique: I am totally in love with the world of Kingdom! Abnett and Vincent have won this reviewer over! The prose does take some time to become familiar but once you pick up it’s primitive, singsong flow, it becomes a great mechanism to draw the reader farther into their world. Some phrases tend to repeat a lot, causing minor annoyance. And I do have a hard time comparing this work with anything that I’ve read. It is Science Fiction mixed with light Fantasy and it is done well. I eagerly, repeat: eagerly, await the next book in this series. At 366 pages, there is a whole world to be discovered and much left for the promised Kingdom Book Two. Until then, I will have to check out the comics, Kingdom: The Promised Land and Kingdom: Call of the Wild. Written on 25th July 2014 by D. L. Denham.